Overwhelming favourite Vautour fell as God's Own claimed a surprise win in the Melling Chase on the second day of the Grand National meeting at Aintree. 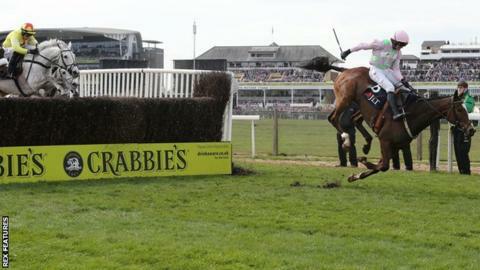 Leader Vautour, a 1-5 shot ridden by Ruby Walsh, appeared in control before misjudging the ninth. God's Own jockey Paddy Brennan took advantage as he held off the challenge of Al Ferof. Earlier in the day, Richard Johnson guided Native River to victory in the Mildmay Novices' Chase. Eastlake - a 22-1 chance - triumphed in the Topham Chase over the Grand National course, but there was disappointment for Bishops Road. The Kerry Lee-trained eight-year-old, who won the Grand National Trial at Haydock in February and narrowly missed out on a berth in Saturday's big race, fell at the first. Vautour had been long been aimed at the Gold Cup at Cheltenham in March but was switched - successfully - to the Ryanair Chase at the Festival just three days before. He looked close the form that pushed Cue Card all the way in the King George VI Chase at Kempton on Boxing Day, jumping beautifully before his unexpected error brought Walsh's race to an early end. His fall also damages Irish champion trainer Willie Mullins' chances of taking the British equivalent from Paul Nicholls. Walsh also suffered a fall on Blood Cotil on Friday and was subsequently ruled out of Saturday's Grand National with a fractured wrist. God's Own's only previous Grade One victory was the Novice Chase at Punchestown in May 2014. "This horse is not the easiest of rides and I'm sure there's been plenty of times I didn't get it right, so it's nice to get it right today," Brennan told Channel 4 Racing. "He's a spring horse and he's been beautifully trained. I can't believe I've won."